Hearty homemade soups make great meals for babies and toddlers. These soups combine meat and vegetables into one easy meal, they are inexpensive to make, and they freeze well for later meals. My twin boys love this split pea soup recipe! beans or peas can also be added. Place all ingredients in crock pot and cook on low all day or on high for 4-5 hours. After soups cool, blend in blender or food processor, adding more water if necessary for desired consistency. Blend soups until completely smooth for younger babies. These soups are suitable for babies 6 months and up who are eating a variety of solid foods and also for toddlers. To freeze soups for later, pour the cooled soup into ice cube trays and freeze until solid. Transfer frozen cubes to Ziploc freezer bags. Happy cooking! 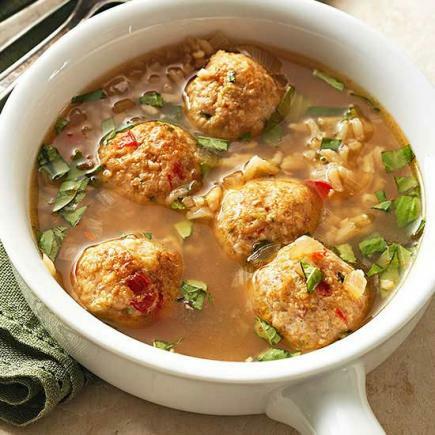 Meatball soups are a great way for weight loss surgery (WLS) patients to enjoy a nutritious tasty meal with easily digested protein. Here are two very good quick soup recipes that take advantage of pantry staples and ready-made fully cooked chicken meatballs from the freezer. Enjoy! Preheat oven to 425. Arrange meatballs in single layer on a cooking sheet sprayed with non-stick cooking spray. Bake for 10 minutes. While meatballs bake heat olive oil in a 4-6 quart stockpot. Brown onion and garlic. To the onions add the green chilies, stewed tomatoes, chicken stock, chili powder, cumin, hot sauce. Simmer the soup for 15 to 20 minutes. Stir in the cooked meatballs and bring soup back to a simmer. Serve soup with garnishes. WLS patients should eat 3-5 meatballs topped with a modest serving of liquid. 5 meatballs contain 13g protein, 11g fat (3 saturated), 6 grams carbs. Preheat oven to 425. Arrange frozen meatballs in single layer on a cooking sheet sprayed with non-stick cooking spray. Bake for 10 minutes. While meatballs bake heat olive oil in a 4-6 quart stockpot. Brown onion and garlic. Add tomatoes and liquid, tomato paste, broth, water, sugar, basil, thyme and oregano. Bring mixture to a simmer, cover and simmer 10 minutes. Add ravioli and cook, covered at a gentle boil according to package directions (approximately 10 to 15 minutes), until they are just tender and no longer have a starchy taste. Stir in meatballs and return to simmer. Stir in parsley and sprinkle with cheese. WLS patients should eat 3-5 meatballs topped with a modest serving of ravioli and liquid.